This story is not flashy. It's not overly heroic or gripping even. What it is, or what it feels like I should say, is very honest and real. This is definitely one of my favorite accounts of the war. This is a very well done book and is quite interesting. It paints a much broader and clearer picture of the actions of SOG than is given in most of the one-sided accounts. It's not all ra-ra nonsense but a balance of what they did right and what they did wrong and what it cost them. I would definitely recommend this audiobook. First, it was really good to hear the author serve as the narrator. I suppose this isn't always a good idea but I liked it and Mr. Ford did quite well. The story itself is very interesting and well told. 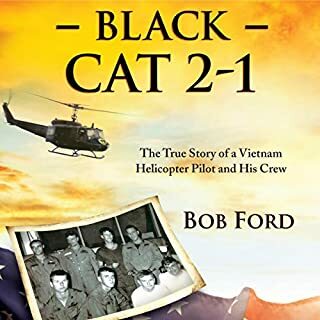 I don't recall having seen or read any stories by pilots specifically in and out of Hue, especially in '68, so it was good to have that bit of void filled. I do have to wonder, is Mr. Ford really as straight-laced as he seems? The author seemed like a strong French (and British) apologist and that the French were largely at the mercy of their American overlords following WWII. If you want to get the angle on how everything from maybe '48-'49 onward was America's (and not France's) fault, this book is for you. The odd thing is that he does explicitly mention that the French (and British) resisted America's anti-colonial opinions and policies so as to support their own declining empires but doesn't put together that they sold their efforts to the US as a battle against Communism when it clearly wasn't. Additionally, if you've studied Viet Nam's history at all you appreciate the problems with the Diem government. The author here specifically mentioned the increasingly "draconian" measures of the Diem government as he worked to solidify his power. This is a fair assessment. What's weird as that the increasingly draconian measures were standard policy by the North from the beginning. For example, they were executing the children of village leaders and even nailing their babies to walls & trees. 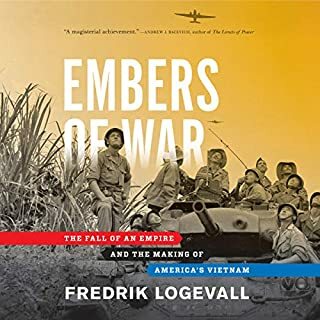 Despite the horrors that were common to both sides in this the author barely even gives lip service to what the North was doing and makes them sound like noble victims for having to suffer the hardships of fighting an insurgency in that environment. Obviously, in the idealized sense, there should be no support for either government, but then that goes down the "Quiet American" path where one (like the author) can't seem to differentiate between ideality and reality. I only mention that because the author seems quite focused on Greene. It's not at the absurd level of Ward & Burns but it's there. I have always been a little puzzled about historians'/authors' position on the breaking of the '54 agreement with regards to elections. There's no doubt that Ho would've won and that not allowing the elections was a bit ironic given that the government of the South was supposed to be some flavor of Democracy. However, the same people never seem to take a step or two deeper. What happens when Ho wins and his entourage follows? Is one to think that subsequent elections would've allowed the people to steer their government? 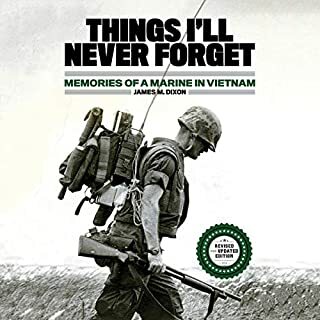 Is it even remotely conceivable that the Vietnamese people could've had "buyer's remorse" and altered the Communist government once it had taken hold? This is the same government that killed and/or imprisoned thousands or tens of thousands in the North and later did the same to upwards of a hundred thousand? The problem with the analyses that I've seen regarding the '54 agreement is that they never both to explore the consequences of having allowed that election to happen. There is a lot of good information in this book and while you can get it from any other combination of books at least here it's all in one spot. There was nothing I hadn't read somewhere else but it was good to have it summarized (again). It's worth the listen. This is a more balanced treatment than you'll get out of Halberstam, Sheehan, and especially Ward but in the end it adds little new to the story. It's certainly not written as well as Halberstam but is thankfully less whiny than Sheehan. The author editorializes way too much and as a result the personal opinions that pop up end up creating inconsistencies in the analyses, some of which were extremely aggravating. He makes the assumption that the supposed intellectual shortcomings of Westmoreland and others in the general staff are notable factors in the failure of the war in a management sense but the same management and planning problems were a result of the actions of people like McNamara, Rusk, and Mac Bundy who were undoubtedly exceptionally brilliant. Saying that the generals were effectively dumb and intellectual capacity was a major player in the wars development and execution is just plain lazy writing. Similar inconsistencies popped up throughout the book. The tone of the writing is geared toward creating this depressing feeling of inevitability on the course of events and it's not the events themselves that create the tone (as it should be). It's the author himself making subjective assessments and introducing his own feelings. They are extremely distracting when the reader/listener is looking to develop and understanding of details, big and small, and how they are all related through the course of the war. This might also be partly due to the narrator's tone of voice. One can't really separate the two. The endless goings-on about racism are ridiculous. A Westerner shoots a Vietnamese civilian and it's because of racism. A Vietnamese shoots the civilian next to him and it's because of revolutionary passions. An ARVN shoots a civilian and it's because of poor command structure. The author does not seem to grasp that the war was not fought because of racism simply because the combatants are of a different race. "We" fought and massacred the Germans as best we could. Individuals on both side rationalize their brutality with racial or cultural generalizations (the Vietnamese called Caucasians apes because of their relative hairiness). Dehumanization through whatever means are what people do when they're battling one another. It doesn't mean it is the CAUSE of the war or even the reason for the conduct of the war. The whole thing about how Westerners had "big feet" when it came to their approach to conducting war and their overall presence was true but NOT in the way the author presented it. Big conventional military units present a large footprint. Why don't you ask some of the old Chinese about the nature of the Japanese during WWII? The Vietnamese weren't people in some magical "Dances with Wolves" parallel world. They maintained a small footprint because it kept them from being spotted and killed (and up until the later years because they didn't have the hardware). Ultimately this book deteriorated into a [predictable] pot of self-loathing that added absolutely nothing and lead me to stop listening with only an hour or so left. It's not a terrible listen. 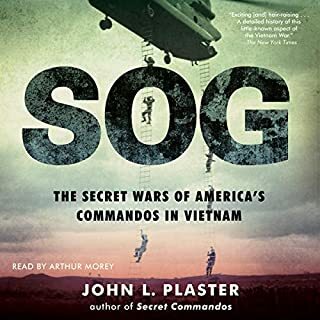 If you've not listened to or read anything else major on the Vietnam War then you might as well go ahead and pick this one. It's a rehash with some modern nuggets added. The down side is that you won't be able to say (or confess) that you read The Best and the Brightest or A Bright Shining Lie, two books that most people recognize. On December 16, 1944, the vanguard of three German armies, totaling half a million men, attacked US forces in the Ardennes region of Belgium and Luxembourg, achieving what had been considered impossible - total surprise. In the most abysmal failure of battlefield intelligence in the history of the US Army, 600,000 American soldiers found themselves facing Hitler's last desperate effort of the war. 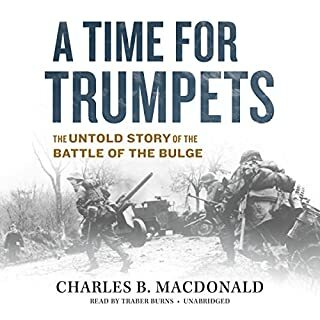 The brutal confrontation that ensued became known as the Battle of the Bulge, the greatest battle ever fought by the US Army - a triumph of American ingenuity and dedication. This book was well written and the audio version was well narrated BUT if you aren't in front of a map or are not intimately familiar with the geography and towns around the Ardennes you will find yourself completely lost. I'm usually out for a walk, run, or even on a stair climber while I listen to audiobooks and that did not work with this book. In 1960 President Eisenhower was focused on Laos, a tiny Southeast Asian nation few Americans had ever heard of. Washington feared the country would fall to Communism, triggering a domino effect in the rest of Southeast Asia. 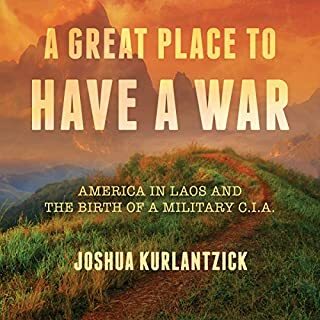 So in January 1961, Eisenhower approved the CIA's Operation Momentum, a plan to create a proxy army of ethnic Hmong to fight Communist forces in Laos. While remaining hidden from the American public and most of Congress, Momentum became the largest CIA paramilitary operation in the history of the United States. Definitely a worth-while read if you're into SE Asia or the evolution of the CIA. There's no one thing about this book that stands out but it's a good source of information to fold in with other works. Up until now, the Korean War has been the black hole of modern American history. The Coldest Winter changes that. 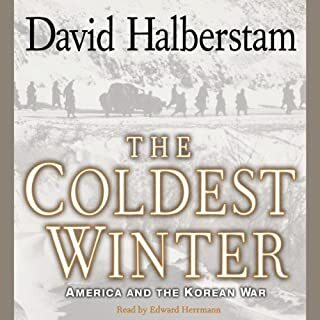 Halberstam gives us a masterful narrative of the political decisions and miscalculations on both sides. 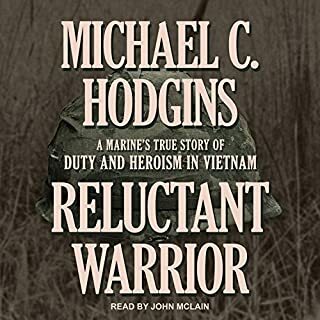 He charts the disastrous path that led to the massive entry of Chinese forces near the Yalu, and that caught Douglas MacArthur and his soldiers by surprise. He provides astonishingly vivid and nuanced portraits of all the major figures. First, Halberstam is(was) obsessed with race and racism. Oddly though it appears only whites are racist. For example he states that US soldiers had Japanese doing menial tasks after the war. But, this was also true in Germany. He states the reason we underestimated the Koreans was racism but the reason they underestimated us was that they overestimated themselves. We were racists and we were imperialist dogs. Go figure. While dehumanization is a key part to fighting a war (japs, Huns, Gooks, etc) the peculiarly one-sided assessment shows up here and shows up in “The Best and the Brightest,” but it is much more prevalent in this book. Getting past the tiresome racism thing this book is very well written and excellently narrated. I do not believe it is as good as TB&TB, not nearly as good, but it is still well done and if you can deal with the constant negativity (most reality and some inherent to Halberstam) you’ll get a good deal out of it. It has certainly piqued my interest in Korea and motivated me to learn more about it. As secretary of defense for Presidents Kennedy and Johnson, Robert S. McNamara was one of the chief architects of American foreign policy, and particularly of the strategy that propelled the U.S. into the Vietnam War. Though he at first firmly believed that fighting communism in East Asia was worth the loss of American lives, McNamara eventually found himself at odds with other members of the Johnson administration when he came to see the ever-escalating was as unwinnable. It's hard to know if McNamara truly believes what he writes, has selective memory, rationalizes for his own emotional survival, or what. 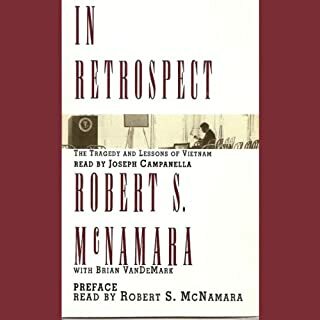 An undoubtedly brilliant man and whose name I think was unfairly attributed to Vietnam (McNamara's War) still failed to see the contradiction in his fundamental mode of operation even after so many decades. He swears he didn't believe bombing was the way to end the war yet he lobbied that manipulating bombing and bombing halts was the way to end it. Now whether ending and winning are synonymous is another matter but in the end all he did along with Johnson was leave our people and the Vietnamese people in the meat grinder for many years more than was necessary to reach the ends that he and others knew was inevitable. 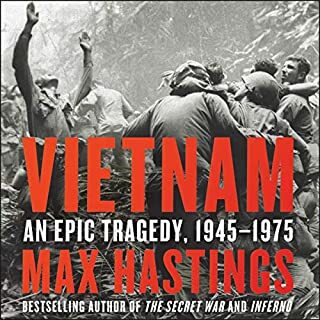 Regardless of McNamara's failings I think this is an excellent book and a must read for anyone studying Vietnam and 20th century US history.